Charles Sumner, U.S. Senator, abolitionist, and orator, was born in Boston on January 6, 1811. A descendant of William Sumner and son of Charles Pinckney Sumner, a sheriff of Suffolk County, and Relief Jacob, a descendant of Nicholas Jacob, who settled in Watertown in 1633, Sumner entered Harvard College at 15. Upon his graduation in 1830, he immediately enrolled at Harvard Law School where he became a pupil and friend of Joseph Story. Sumner became a lecturer at Harvard Law and became friends with Francis Lieber and William Ellery Channing, who became a great influence. He also became lifelong friends with Whittier, Emerson, and Henry Wadsworth Longfellow. Sumner traveled to Europe at 26 and learned French, German, and Italian alongside the workings of European governments and jurisprudence. In 1845 he was chosen as orator for Boston’s Independence Day celebration, and his speech, “True Grandeur of Nations” denounced war and became a turning point in his career. In 1848 his anti-slavery speech led to his election to the U.S. Senate as the candidate of the Democrats and Free Soil Party. He held this post for 23 years. Sumner was a strong opponent of slavery, and his numerous vocal oppositions to the Fugitive Slave Law, and the Kansas-Nebraska Bill, led to a brutal attack by a South Carolina representative on the floor of the Senate. The physical damage forced Sumner to be absent from his post for three years. Upon his return in 1859, Sumner continued his opposition of slavery and in 1861 was the first to encourage emancipation. He was elected chairman of the Senate Foreign Relations Committee in 1861. After the war Sumner took part in the motion to impeach President Andrew Johnson, and later came into conflict with President Grant. Sumner lost his chairmanship in 1871 specifically because of his opposition to Grant’s initiative to acquire Santo Domingo. Sumner died at his home in Washington on March 11, 1874. After his body lay in state in the Rotunda of the Capitol, it was transported to Boston in special railcars draped in mourning bunting. Thousands paid respect to Sumner in the State House, where his coffin rested until his funeral at King’s Chapel. The procession followed his flower-draped coffin for the entire five-mile walk from Beacon Hill to Mount Auburn. 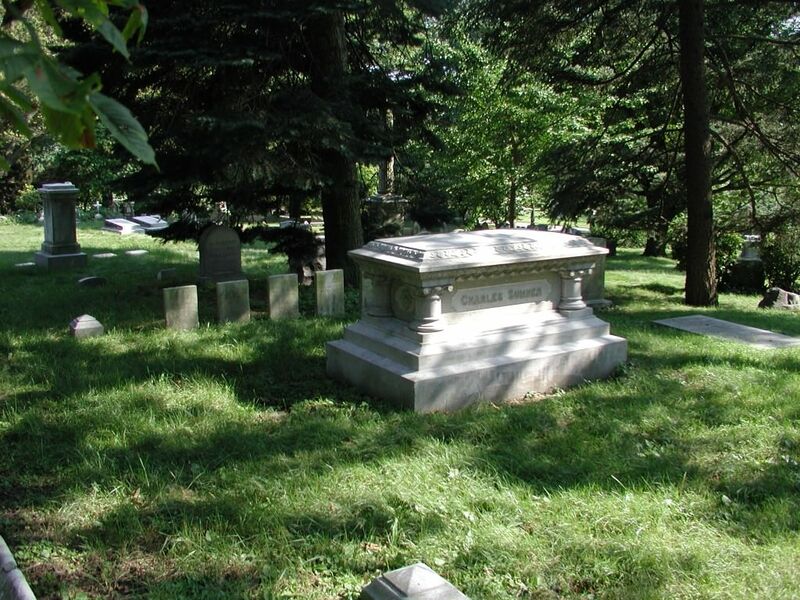 Charles Sumner is buried in Lot 2447 on Arethusa Path. Adapted from the research of Judy Jackson and Janet Heywood, as published in Mount Auburn’s January Birthday: Charles Sumner, 2003.